The LORD will first improve the earth during the millennial kingdom and then make new heavens and a new earth. In part 12 of Isaiah: Behold the Salvation of Immanuel, Pastor Dan Cox reads from Isaiah 65:17-25. The LORD has anointed His people to proclaim good news. In part 11 of Isaiah: Behold the Salvation of Immanuel, Pastor Dan Cox reads from Isaiah 61:1-11. *Please note: The quality of this audio file is poor due to technical issues. The LORD invites spiritually thirsty people to come to Him while He may be found and receive everlasting life and sure love. In part 10 of Isaiah: Behold the Salvation of Immanuel, Pastor Dan Cox reads from Isaiah 55:1-13. Jesus, the humble suffering servant of the LORD, was punished for our sins in order that we might be made righteous. In part 9 of Isaiah: Behold the Salvation of Immanuel, Pastor Dan Cox reads from Isaiah 53:1-12. The eternal, majestic, sovereign LORD who has no equal in all the universe graciously comforts and strengthens all who trust in Him. In part 8 of Isaiah: Behold the Salvation of Immanuel, Pastor Dan Cox reads from Isaiah 40:1-31. God gives shalom-perfect peace-to all who trust in Him and keep their thoughts firmly fixed on Him. In part 7 of Isaiah: Behold the Salvation of Immanuel, Pastor Dan Cox reads from Isaiah 26:1-19. All those who would proudly lift themselves up will be brought low. In part 6 of Isaiah: Behold the Salvation of Immanuel, Pastor Dan Cox reads from Isaiah 14:1-23. Jesus is the eternal King who has brought light, joy and freedom into the world and will rule with peace and justice forever. In part 5 of Isaiah: Behold the Salvation of Immanuel, Pastor Dan Cox reads from Isaiah 9:1-7. The Sovereign LORD calls His people to firm faith, but will accomplish His sovereign purposes regardless. In part 4 of Isaiah: Behold the Salvation of Immanuel, Pastor Dan Cox reads from Isaiah 7:1-25. The thrice-holy God atones for sin, removes the guilt of His servants and commissions them for service. 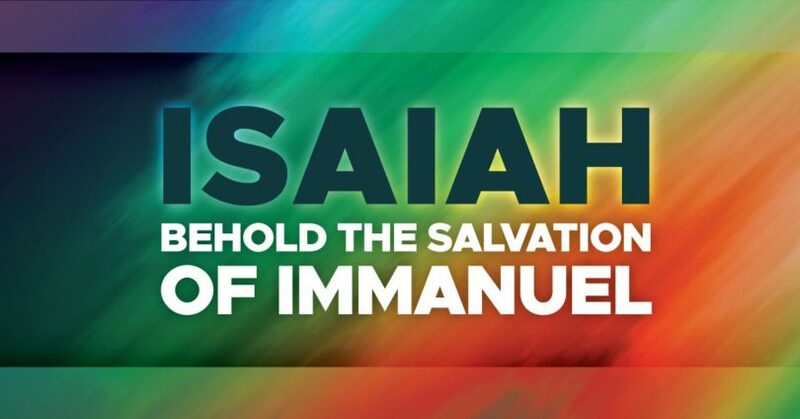 In part 3 of Isaiah: Behold the Salvation of Immanuel, Pastor Dan Cox reads from Isaiah 6:1-8.